Between her blog No Shelf Required and her book of the same name, Sue Polanka of Wright State University has been helping librarians understand the growing shift towards e-books and embrace the opportunities they present within traditional collection development activities. 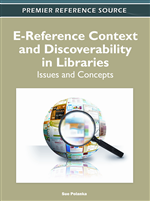 Her most recent contribution on the subject, E-Reference Context and Discoverability in Libraries: Issues and Concepts has just been released by IGI Publishing. It brings together the ideas of librarians, publishers and other industry professionals on different ways for libraries to adapt and innovate using the new technology. Paratext’s own Eric Calaluca is a contributor to the work, with an article entitled ”Indexing Scholarly Reference: Helping Researchers do Less.” The article covers the entire history of the Reference Universe service, from its inception in 2003, up to current activities to integrate the unique metadata it contains with larger ‘discovery layers’ now being considered by both large and small libraries. Paratext recommends Sue’s new work for all serious bibliographers; public service and collection librarians. It reflects a contemporary and broad cross section of opinion and insight into the opportunities for improving libraries in the new digital age.